Petr Tomek | AK-Mechanika, s.r.o. Petr mainly deals with computational analysis of machinery for power and electrical industry and transport. He is involved in the development of new machines, devices and equipment. University Pardubice, Jan Perner Transport Faculty – PHD: Technology in Transport and Communications, Transport and Infrastructure (2008 – 2012). University Pardubice, Jan Perner Transport Faculty – BC and MS: Transportation Engineering and Communications, Transport means (2003 – 2008). Certificate of completion of the 4-day technical course "Calculations of strength, stability, service life and pressure testing of pressure equipment" with a focus on the current state, the new edition of standards for unfired pressure vessels EN 13445:2009 (EN 13445:2010), relation to the government regulation, designed and harmonized standards, European Directives PED (97/23/EC) and the world-recognized standards and technical regulations ASME BPV Code, AD 2000, CODAP and PD 5500th TConsult, Šlapanice u Brna, May 2011. Certificate of Completion 2-day technical course "Pressure equipment according to directive 97/23/EC (PED) – World standards / EU / Czech Republic" focusing on the current state to the new edition of standards for unfired pressure vessels EN 13345:2010, water-tube boilers EN 12952:2012, metallic industrial piping EN 13480:2012, standards for pressure equipment materials ČSN EN 10028:2009 / 2010 and related welding standards. TConsult, Šlapanice u Brna, March 2013. 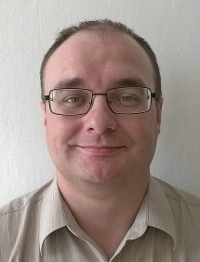 University Pardubice, Jan Perner Transport Faculty (2011 to the present) – he is a teacher at the position of Associate Professor at the Department of Mechanics, Materials and Machine Parts. AK-Mechanika, s.r.o. (2008 to the present) – external cooperation, computational analysis in the field of mechanical engineering. Tomek, P., Paščenko, P., Středová, D.: Vývoj experimentálního zařízení pro zkoušky ztráty stability tenkostěnných vrchlíků. Sborník konference s mezinárodní účastí TechMat 2010, s. 205-210. ISBN 978-80-7395-324-9. Svitavy (2010). Středová, D., Paščenko, P., Tomek, P.: Vliv polohy počáteční imperfekce na únosnost kulového vrchlíku zatíženého vnějším přetlakem. Sborník konference s mezinárodní účastí TechMat 2010, s. 247-250. ISBN 978-80-7395-324-9. Svitavy (2010). Tomek, P., Paščenko, P., Schwarz, S., Zelenka, J.: Kostra kapoty železniční diesel elektrické lokomotivy (etapa 1). Výzkumná zpráva, Univerzita Pardubice, 2012. Tomek, P., Paščenko, P., Schwarz, S., Zelenka, J.: Kostra kapoty železniční diesel elektrické lokomotivy (etapa 2). Výzkumná zpráva (A10-01/2010-UPa), Univerzita Pardubice, 2012. Středová, D., Paščenko, P. Tomek, P.: Production preparation of conical shell test specimen. Proceedingsof 14th Conference Applied Mechanics 2012, pp. 167-170. Západočeská univerzita v Plzni, 2011. ISBN 978-80-261-0097-3. Tomek, P., Paščenko, P. Středová, D.: Modification of test equipment for testing the loss of stability. Proceedingsof 14th Conference Applied Mechanics 2012, pp. 175-178. Západočeská univerzita v Plzni, 2011. ISBN 978-80-261-0097-3. Tomek, P.: Ověření možností numerické simulace degradačního procesu povrchových vrstev kol se zahrnutím vlivu lokální plasticity a kumulativního charakteru dějů. Výzkumná zpráva (A10-01/2010-UPa), 2011. Tomek, P., Paščenko, P.: Influence of boundary conditions on the loss of stability of imperfekt spherical caps. Proceedingsof 13th Conference Applied Mechanics 2011, pp. 223-226. Ústav fyziky materiálů AV ČR, Brno, 2011. ISBN 978-80-87434-03-1. Středová, D., Tomek, P.: Experimental Model Of Conical Shell Under External Pressure. Perner´scontacts, Special Issue 2, Vol. VI, May 2011, pp. 174-176. University of Pardubice. ISSN 1801-674X. Paščenko P., Tomek P. (2010). Ztráta stability příčně zatížené válcové skořepiny. Výzkumná zpráva (MŠMT č. C56/2010). Paščenko P., Tomek P. (2010). Vývoj zkušebního zařízení k testování stability kulových vrchlíků. Výzkumná zpráva (MŠMT č. C56/2010). Paščenko, P., Středová, D., Tomek, P.: Stability of thin walled structures. International Journal of Applied Mechanics and Engineering, Vol. 15, s. 483-490. University Press Zielona Góra. ISSN 1425-1655. Zielona Góra (2010). Tomek, P., Paščenko, P.: Loss of stability of laterally loaded cylindrical shell. Proceedings of 12th International Scientific Conference Applied Mechanics 2010, Technická univerzita v Liberci. ISBN 978-80-7372-586-0. Liberec (2010). Tomek, P., Středová, D.: Příčné zatěžování válcové skořepiny. Sborník konference TechMat 2009, ISBN 978-80-7395-046-0. Svitavy (2009). Tomek, P., Středová, D.: Postbuckling behavior of saddle loaded shell in Scientific Papers of University of Pardubice. Series B, The Jan Perner Transport Faculty. Pardubice (2009). PAŠČENKO P., TOMEK P., STŘEDOVÁ D. Stability of thin-walled shell structures – Stability of a spherical cap. University of Pardubice 2013, ISBN 978-80-7395-697-4. (in Czech).